Keto Red Velvet Cake | Cream Cheese Frosting! This keto red velvet cake recipe has been a long time coming. We've had MANY requests to say the least and we finally perfected it. Watch the video below to see Matt make it step by step and then head into the kitchen and make all your red velvet cupcake dreams come true! Baking Without Sugar Is Still Delicious. The substitutes taste just as good or at the very least take a little getting used to and don't spike your blood sugar! No blood sugar roller coaster for you means more desserts and less of the guilt. 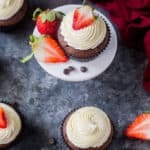 We've turned out keto red velvet cake recipe into cupcakes so sharing is easier and topped it with a very simple cream cheese frosting. You can leave out the coloring altogether or go the natural route using the link below in the ingredients section. Everyone Needs A Good Keto Cake Recipe! And, we've got plenty of them. Do you like a dense cheesecake style cake? Try out Butter Cake out! Do you like light and fluffy? Try our Cinnamon Ricotta Cake! What about dense and buttery? Try our Olive Oil Cake, but sub in butter for the olive oil! Frosting are in our wheel house as well - you've got the perfect cream cheese frosting below and we also have easy and delicious butter cream frostings, chocolate and vanilla! Keto Red Velvet Cake With Cream Cheese Frosting! Is there a better pair in this world? I think not! The rich, dense, moist red velvet cupcake dressed with an equally rich and dense frosting means indulgence to the max. 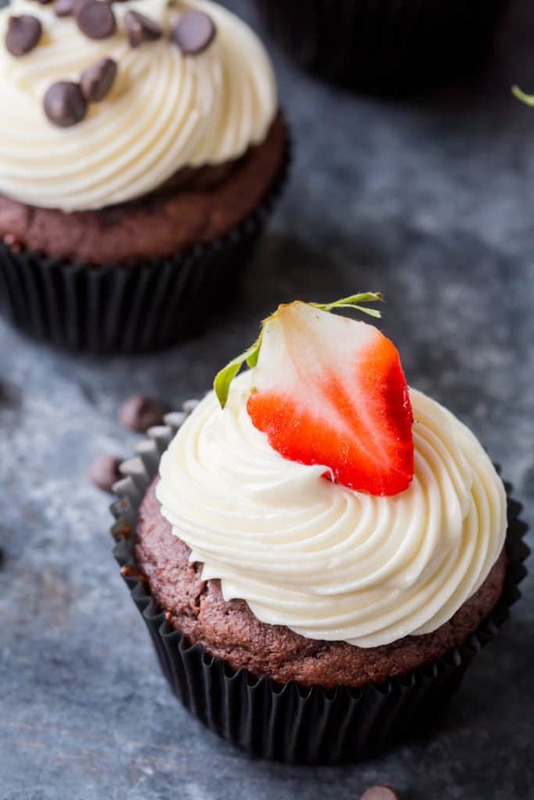 You can easily turn this cupcake recipe into your next birthday cake or make it for the Fourth of July holiday party and winner festive employee of the year. Either way you make this keto red velvet cake is going to win you and everyone who trys it over, guaranteed! 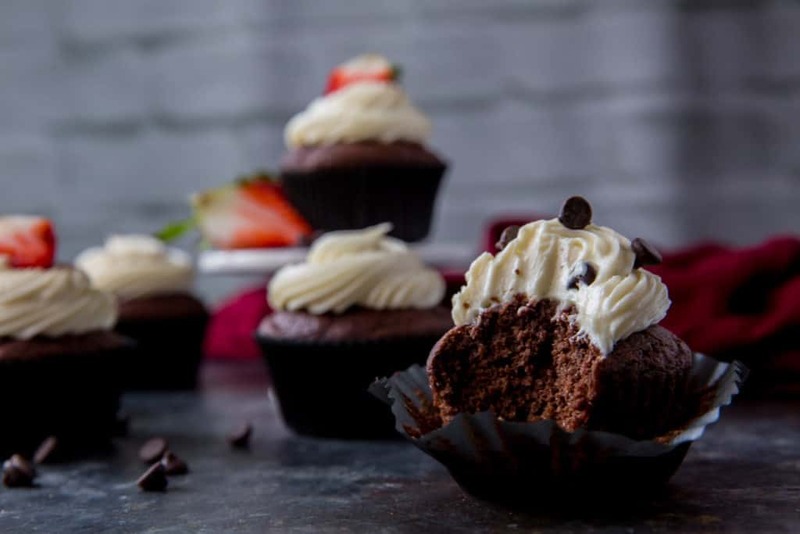 Recipe can be quickly added to MyFitnessPal - Search "KetoConnect - Keto Red Velvet Cake"
Preheat oven to 350 degrees F. Line a muffin tin with cupcake liners or grease with coconut oil spray and set aside. In a medium bowl, whisk together almond flour, coconut flour, erythritol, cocoa powder, baking powder, baking soda, and salt. In a separate bowl, mix eggs, melted butter, stevia, vanilla, vinegar, and red food coloring (or substitute for natural coloring). Add the wet ingredients to the dry ingredients and mix until just combined. Divide the batter between the cupcake liners, filing them ¾ of the way full. Bake for 20-25 minutes, until a toothpick inserted in the middle of a cupcake comes out clean. Allow to cool completely. Using a hand mixer, beat the cream cheese and butter together on medium speed until smooth, 3-4 minutes. Scrape down the sides of the bowl, then add the remaining ingredients. Mix 3-4 minutes until fluffy. Add more powdered erythritol if you like it sweeter, or heavy cream for a fluffier consistency. Pipe or spread on cupcakes as desired. Serve and enjoy! Best stored in the fridge in an air tight container up to 7 days.